I have been buying and discarding PC phones for some time. Until recently, the experience has been universally bad. Most devices were just cheap microphones and speakers embeded in plastic made to look like a phone. In operation however, the sound quality was bad and the functionality marginal. In most cases, the devices just acted as a microphone and speaker, screwing up your PC in the process. Happily, Linksys has come out with a truly useful cordless phone that integrates seamlessly with Skype. 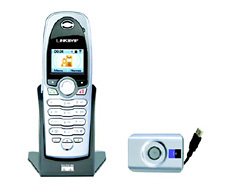 The phone looks like any other cordless phone, but the base plugs into a USB port on a PC instead of to a phone line. A software program is installed on the PC to make the link between Skype and the cordless phone. The result is that one now has a cordless phone that can display the Skype contact list, in colour, with the same status symbols one is used to on the PC. Using SkypeOut, the "for pay" long distance service, it is possible to call any phone number in the world for about 2 cents US$ per minute. My parents were travelling in India and Pakistan over Christmas, and I was unable to reach their cellphone using Starhub or Singtel. Amazingly, I got through using SkypeOut, and for considerably less money than the carriers in Singapore wanted to charge. I have to say that Linksys has hit a home run with this product. It does exactly what is supposed to do, has a clear colour display, feels good to hold, and has good audio quality. The price is a bit steep (S$179 from South Asia in Funan), but the operational savings are worth it. We were juz setting up a new Singapore Blogsite list website. The reason i email is i was wondering if u would like to JOIN in to our blog toplist. Iz a standard toplist website wif web statistic review.